A Caravan Service is an extremely important aspect of ownership. Your caravan needs servicing every year, whether you’ve used it or not and also to maintain the manufacturer warranty. It’s easy to overlook the early signs of water ingress and damp, which can cause serious damage over time. Gas and Electric appliances can become dangerous if they aren’t properly maintained. We offer the full NCC Approved Workshop Service for your caravan. Our Caravan Service will maintain your manufacturers warranty. You will receive the full service scheduled paperwork. We stamped service book. 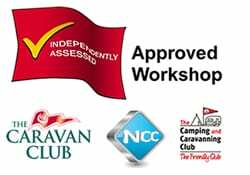 We also provide you with an NCC Approved Workshop service stickers for your caravan. By choosing Direct Leisure Repairs for your caravan servicing, you’ll get the peace of mind that comes from the knowledge your caravan is safe, ready for the season. Comprehensively looking for any faults or early warning signs, we aim to deliver the best possible service at a very competitive price. All our prices are fully inclusive and include a damp report, hub nuts.